News of the death, back in June, of Bogdan Dochev, the Bulgarian linesman who failed to flag up Diego Maradona’s handball in Argentina’s win over England at the 1986 World Cup, prompted me to revisit some stills of that infamous goal: the diminutive forward implausibly out-jumping the English goalkeeper, Peter Shilton, to propel the ball into the net with his fist. Aged only five at the time, I have no recollection of watching the tournament, and in all likelihood I did not catch a single minute of it. I experienced Mexico ’86 as part of a heritage, in its afterlife on the pages of soccer magazines pored over from 1988 to 1990, the formative years of a lifelong obsession. Those shimmery, low-resolution photographs of sundrenched Latin American stadia had an impressionistic vitality that would, over time, become inextricably bound up in my memory of early youth. When, twenty-five years later, the photo-sharing app Instagram appeared, with its filters enabling users to doctor their photographs in Ektachrome tones, it was my generation that flocked to it in droves. 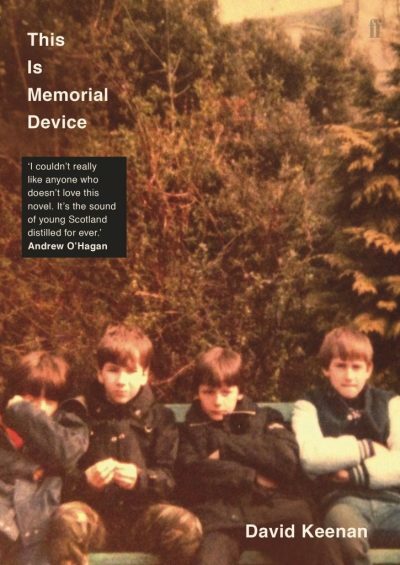 The photo on the cover of David Keenan’s debut novel is, I am reliably informed, from the author’s personal collection: four young lads hanging out, squinting against bright sunshine, in blurry low-res. It is a quietly, understatedly evocative image. They say you should never judge a book by its cover. They are mistaken. This is Memorial Device is composed of a series of fictive interviews with the fictive personalities comprising a fictive music scene in the Scottish town of Airdrie in 1983. The music is broadly categorisable as post-punk — The Fall, Pere Ubu and Iggy Pop are frequently name-checked — along with a smidgen of emergent electronica. The interviews are loosely concerned with retracing the trajectory of a cult local band called Memorial Device, but pan out to a wider panorama of the local subculture of Airdrie and nearby Coatbridge. The unprepossessing backdrop is no accident: this novel is a fond celebration of youthful esprit and artistic energy, which can flourish in the unlikeliest of places. This, lest we forget, is the culturally impoverished landscape of 1980s Britain, where Turkish Delight is considered ‘sophisticated — you know, like garlic or pasta.’ You have to make your own fun here. This Is Memorial Device may be read straightforwardly as a nostalgic paean to the author’s own youth. Its portrait of raw, late-adolescent zeal – often misguided and misdirected, but always energetic and earnest, a force of nature – transcends its socio-historical context: ‘Back then,’ says one interviewee, ‘we were on the tipping point between terror and goad.’ But its greater significance resides in its documenting of a mode of cultural engagement that would be rendered nearly obsolete within a couple of decades. It is impossible for anyone over the age of 30 to read this highly entertaining novel without feeling a sense of dislocation, and of regret – however counterintuitive, however reactionary – for the passing of an era in which cultural capital was so precious that you cherished every little bit you could get your hands on. Young music obsessives – myself included – were once in the habit of compiling lists of our favourite albums, which we often referred to as our favourite albums ‘of all time.’ The casual hubris of that ‘of all time’ – equating the forty-year stretch from Elvis until the 1990s, a mere blink of an eye in historical terms, to all eternity – says so much about the solipsistic, naive confidence of a generation who took their singularity for granted, and experienced their heritage as a long cultural moment that would endure in perpetuity. It is, of course, pointless and futile to dwell on the decline of guitar music per se; it will take its place in posterity’s broad sweep of something called popular music. 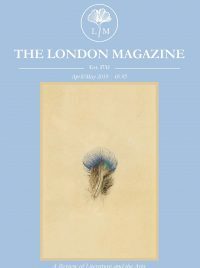 What matters is the the total transformation of the ecology of cultural consumption, in particular the decline of the object fetishism that drove our earliest engagements with music and literature alike. Never mind sniffing underwear – one of Keenan’s characters sniffs vinyl. This is what we are losing in a world of digital superabundance: the peculiar numinosity invested in the physical object by virtue of its connotational properties, its promise of access to something transcendent; and the attendant sense of urgency, bordering on mania, that animates our search for meaning in a world of scarcity. But we have gained so much more in return, and besides, our irrepressible impulses – creative, critical, social and sexual – will find new outlets, as they always must. Words by Houman Barekat, originally published in the October/November 2017 edition of The London Magazine.